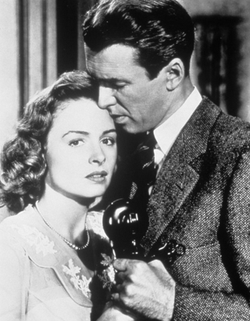 Okay, let’s get this out of the way straight off — I had never seen It’s a Wonderful Life before last night. I know what you’re thinking. I swear I’d never seen it. Does that make me un-American? Nah, it makes me a Jew. If this is one of your favorite movies, or you think of it as a Christmastime tradition, you may want to stop reading because I’m about to skewer this piece of crap. It was all I could do to get through it, and given I’m a huge James Stewart fan that’s saying something. Let’s begin with the obvious. What a bunch of sappy garbage. God talking to angels and mean old Mr. Potter trying to take over the lovely town of Bedford Falls. It’s ridiculous. I’m already on the record saying I think Frank Capra is a horrible director who makes awful films (Mr. Smith Goes to Washington for example which I trashed earlier in this countdown). The screenplay is silly. The plot is even sillier. It’s a pure rip off of A Christmas Carol. I don’t know what this film has to do with Christmas frankly, given that the only connection it has is that it ends on Christmas eve. Why did this become a Christmas tradition? It makes no sense (maybe simply because it is a rip off of Dickens?). Is it a Christmas film because God and angels have speaking roles? I won’t even go into the ridiculous religious themes of the film with all the praying and guardian angels. Yuck! I’ll say one good thing about this film — in spite of everything else it has some decent performances by James Stewart and Donna Reed (quite the 1940s babe by the way!). Reed makes you want to settle down in a town like Bedford Falls and have a bunch of kids. Stewart is his usual wise but somewhat silly good guy. Oh, one more good thing about this — I don’t have to watch it ever again! Go ahead, say I’m a grinch. Bah Humbug!